Legacy coach Dave Snyder said he had a good feeling on the team’s bus ride over to Arbor View Thursday night for the annual Battle of the Bulls. The No. 8 ranked Longhorns (3-1) were feeling quite good after a 7-0 upset of the No. 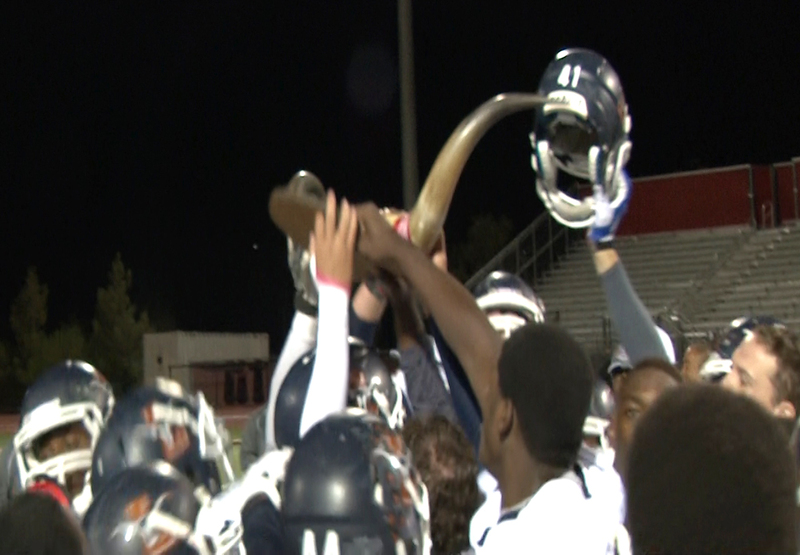 2 rated Aggies (2-1) and taking over possession of the prized horns that goes to the winner. Junior DeMichael Walker scored on a one-yard run off right tackle late in the third quarter for the game-winning touchdown, capping an impressive 10-play, 75-yard drive. But it was the Legacy defense, led by linebacker Josh Phillips and two-way star Casey Hughes, who also rushed for 106 yards, that deserved to take the bows after this one, shutting out an Arbor View team that had averaged 38.5 points in wins over Centennial and Coronado. “These kids stepped it up and they played well defensively,” Snyder, who also praised the work of defensive coordinator Terry Tarver, said. “They really did. It was outstanding. You couldn’t ask for more. The Longhorns did it by bending but not breaking and forcing three turnovers, the final one coming on a fumbled center exchange by Aggies quarterback Andrew Cornwell on 4th-and-4 at the Legacy 13 with 7:55 remaining. “We didn’t make any points out of them but any time you can create turnovers, especially with a ball control offense, it was big for us,” Snyder said. Arbor View, which finished with 229 yards rushing, had three drives that ended at the Legacy 36, 30 and 13-yard lines.